The 12 gauge has been around since the 1870's, and yet it remains one of the most loved, used, and effective rounds of our time. Proven through years of hunting, sport shooting, self defense, military, and law enforcement use, none can deny the abilities of the 12 gauge shotgun. Brenneke has been around since 1895 and is one of the most respected ammunition companies in Germany. However, their USA branch specializes in shotgun slugs and makes some of the best available. 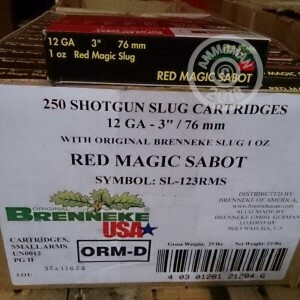 These Brenneke Red Magic shells are affordable and deliver the hard hitting performance needed for hunting and self defense applications. Each hull in this 5 round box measures 3" in length and carries a one ounce sabot slug that leaves the barrel around 1,673 feet per second. Pick up a couple boxes of these sabot slugs today! Remember, at AmmoMan.com all orders over $99 qualify for Free Shipping!